A really splendid quality CARLTON WARE breakfast piece . 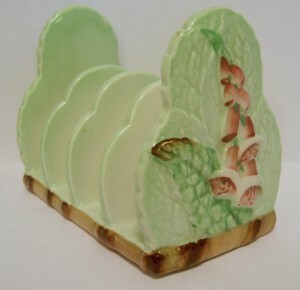 It is a vintage Australian design handpainted Foxglove 4-Slice Toastrack dating from the 1940s period. It has a very detailed and intricate design of embossed purple foxgloves at either end with a brown border all set against a green ground. It is 4.5 inches ((10 cms) long with a maximum height of just over 3 inches (8 cms). The width is 2.25 inches ((6 cms).